Haircoat changes are a sign of PPID. See Hypertrichosis/Hirsutism. "These findings document that excessive hair growth (hypertrichosis) in PPID-affected horses is due to persistence of hair follicles in A (anagen). Furthermore, treatment with pergolide improved shedding and reduced the percentage of A follicles in PPID-affected horses." For weight loss and to reduce high glucose and insulin peaks, a diet based on hay/forage with a low sugar (ESC) and starch content is recommended for horses with IR/EMS. The Laminitis Site, and Dr Eleanor Kellon and the ECIR group, suggest that the total sugar and starch in the diet should not exceed 10% (on a dry matter basis). Fructans (the difference between ESC and WSC) do not cause insulin to increase and are currently (2018) considered unlikely to contribute to endocrinopathic laminitis. See Diet. When can new hay be analysed and fed? Is old hay better for laminitics? How much hay do horses eat and what hay do they like to eat? How should hay be fed? See also Management strategies for EMS/Insulin Resistance. The only way to know the nutritional (including sugar/WSC/starch) content of hay is to have it analysed - you cannot tell the nutritional content by the colour of the hay, and old hay doesn't necessarily have less sugar than new hay. TLS recommends having ESC analysed, rather than "sugar" or WSC. Companies that do this are ForagePlus in the UK (who send samples to Equi-Analytical), and Equi-Analytical in the USA. For a horse with insulin dysregulation, the important figures on a hay analysis are ESC (simple sugars) and starch. A good hay analysis will report ESC, WSC and starch. The ECIR group recommends that combined ESC and starch should be below 10%. WSC = ESC plus fructans - there is currently little evidence that naturally eaten fructans increase insulin levels or contribute to the risk of laminitis - see Do fructans cause laminitis? Equi-Analytical have common feed profiles from the many samples that they analyse on their website. Below are average and standard range figures for grass hay samples from 2000 to 2014. Note that these samples will include C4 as well as C3 hay, and therefore may not be particularly representative of northern European/UK hay, which will be mostly C3. See Equi-Analytical Common Feed Profiles. Can typical values for minerals in hay be used? Hays analysed from the same area tend to have broadly similar profiles, e.g. high iron, low zinc and copper (although this is typical of most hays! ), but actual mineral contents can vary considerably between fields or between years from the same field, so you cannot use your neighbour's or last year's hay analysis to accurately mineral balance your hay. M. J. S. Moore-Colyer (1996). Effects of soaking hay fodder for horses on dust and mineral content. 4 bales of mature multi-species meadow hay were analysed. Sodium and calcium levels were similar in all 4 bales, but significant differences were found in levels of nitrogen (protein), phosphorus, potassium and magnesium between the 4 bales. Minerals that are present in hay in a readily available ionic form will be leached out by soaking. Sugars (glucose, fructose and sucrose) are more readily reduced by soaking than fructans (Longland et al. 2011). Hay, haylage and silage was analyzed for yeast, mould and bacteria before and after soaking in water for 24 hours. Soaking increased counts of yeasts and lactic acid bacteria (LAB). Enterobacteria counts increased after soaking silage and haylage, but not hay. Soaking decreased mould counts in hay, but soaked hay had higher mould counts than unsoaked silage and haylage. "Soaking forage for 24 hours may therefore reduce the hygienic quality of forage." Soaking different hays caused protein to remain the same, increase and decrease. Calcium, phosphorus, potassium and magnesium were reduced with longer soaking times. Phosphorus supplementation would have been necessary when feeding hay soaked for 12 hours. "The aim of this study was to determine the amounts of water-soluble carbohydrate (WSC), WSC constituents and protein leached from a range of U.K. hays soaked according to common practice. Initial hay WSC content ranged from 123 to 230 g/kg dry matter (DM). Soaking the hays for up to 16 hours in water at a mean temperature of 8°C resulted in a mean loss of 27 per cent (range 6 to 54 per cent) of hay WSC. The mean percentage losses of WSC constituents were 24 per cent (range 14 to 31) for fructan, 41 per cent (range 21 to 70) for fructose, 45 per cent (range 28 to 100) for sucrose and 56 per cent (range 29 to 100) for glucose. The mean crude protein content of the initial hays was 58.7 g/kg DM (range 30 to 86 g/kg DM) and this value was not affected significantly by soaking. Despite a mean WSC loss of 27 per cent, the WSC contents of seven of the hays remained above the suggested upper limit for laminitic animals of 100 g/kg DM." The type of hay, length of time the hay is soaked and temperature of the water used all affected ESC, WSC and fructan losses. 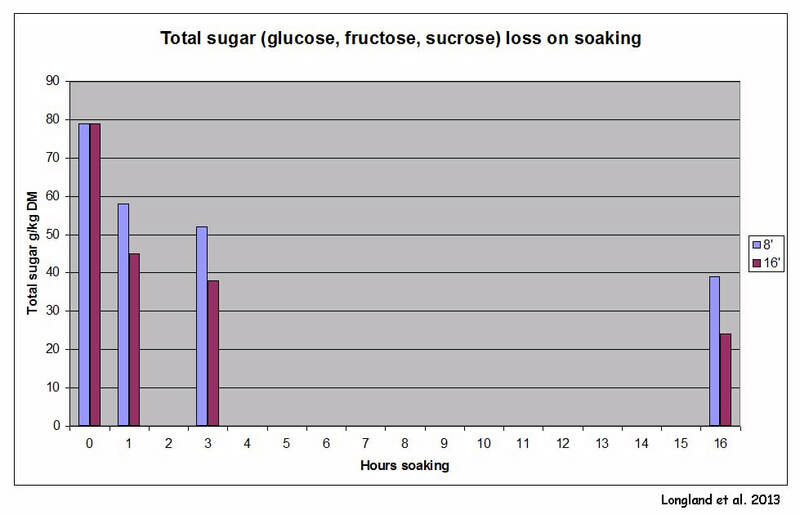 Research by Longland et al 2013 recorded a 28% loss of total simple sugars or ESC (glucose, fructose and sucrose) after 1 hour's soaking in 8'C water, which increased to a 53% loss (an additional 25% loss compared to 1 hour) after 16 hour's soaking. Using warmer water (16'C) increased total sugar losses to 48% after 1 hour and 74% after 16 hours (an additional 26% loss compared to 1 hour). As the hay samples started at less than 10% sugar and a 1 hour soak brought all samples to less than 6% sugar, there seems little benefit in soaking for more than 1 hour, particularly in hot weather when soaking may cause bacterial overgrowth/fermentation. M. Blackman and M. J. S. Moore-Colyer (1998). Hay for horses: the effects of three different wetting treatments on dust and nutrient content. Soaking hay for 10 minutes and 30 minutes significantly reduced levels of sodium, potassium, magnesium, phosphorus and copper (but presumably not nitrogen, calcium, zinc, manganese and iron which were also tested). 2.5 kg sections of mature meadow hay were soaked in 54L water for 0 mins, 30 mins, 3 hours and 12 hours and sodium, potassium, phosphorus, magnesium, calcium and nitrogen (protein) was measured. WSC was 4.1% in the unsoaked hay and wasn't analysed after soaking. Sodium: (content of dry hay was high at 0.63%, compared to NRC 2007 0.02%, Dengie typical range 0.05-0.15%) 42% was lost after 30 minutes soaking, 60% after 3 hours, 69% after 12 hours. Potassium: (1.45% dry hay, NRC 2007 1.97%, Dengie 1.5-2.5%) 27% was lost after 30 minutes soaking, 57% after 3 hours, 63% after 12 hours. Phosphorus: (0.28% dry hay, NRC 0.26%, Dengie 0.1-0.3%) 14% was lost after 30 minutes soaking, 35% after 3 hours, 39% after 12 hours. Magnesium: (0.16% dry hay, NRC 0.18%, Dengie 0.1-0.2%) 0% was lost after 30 minutes soaking, 18% after 3 hours, 25% after 12 hours. Calcium: (0.37% dry hay, NRC 0.47%, Dengie 0.25-0.65%) no losses. Effects of soaking hay on its nutritional quality. Is there any danger feeding soaked hay? "when soaking in hot weather, you can get bacterial overgrowth very rapidly, so in those cases don't soak longer than two hours." Is haylage suitable to feed to a laminitic pony? The fermentation process in correctly made haylage will significantly reduce the WSC levels from those in the freshly cut grass. Marksway Horsehage gives figures representing typical samples of <3% sugar and 1-2% starch for all their haylage products (the ACVIM consensus statement on EMS recommends feeding <10% combined WSC (sugar) and starch (all figures DM)). In her book The Truth About Feeding Your Horse (2007), nutritionist Clare MacLeod says "Haylage can be a safe feed for laminitis-prone horses and ponies, but a high dry matter, high-fibre, low-protein haylage with low residual sugars should be selected." If you decide to try haylage, as with all new feeds, introduce it slowly over several days, and monitor your horse closely. Can haylage be soaked before feeding? Soaking haylage is not generally recommended as there is a risk of starting a secondary fermentation which could result in the proliferation of undesirable micro-organisms. The sugar and starch content in correctly made haylage is usually low enough that further reduction should not be necessary for most laminitic horses. "Haylage need not be soaked because (a) high levels of water soluble sugars are not present and (b) once wet, it goes off and becomes unpalatable extremely quickly"
From Equine Applied and Clinical Nutrition - R Geor, P Harris, M Coenen 2013 p 378 - silage or haylage with a high moisture content can undergo a process of secondary fermentation within hours at high temperatures or within 2-5 days at low temperatures. Botulism in adult horses is most commonly caused by horses eating poorly conserved forage (silage, haylage, hay or straw) - pH above 4.5 and/or high water content may encourage the growth of clostridium botulinum - see Equine Applied and Clinical Nutrition - R Geor, P Harris, M Coenen 2013 p 601. Reasons for performing study: In the treatment of laminitis it is believed that reducing tension in the deep digital flexor tendon by raising the palmar angle of the hoof can reduce the load on the dorsal lamellae, allowing them to heal or prevent further damage. Conclusions and potential relevance: The models in this study predict that raising the palmar angle increases the load on the dorsal laminar junction. Therefore, hoof care interventions that raise the palmar angle in order to reduce the dorsal lamellae load may not achieve this outcome. Raising the heels will put the alignment of the phalangeal bones further out of alignment, risks increasing compression at the coronet and further shearing of the laminae at the toe, leading to further rotation. "OBJECTIVE: To investigate the effects of heparin administration on urine protein excretion during the developmental stages of experimentally induced laminitis in horses. ANIMALS: 13 horses. Procedures-Horses received unfractionated heparin (80 U/kg, SC, q 8 h; n=7) or no treatment (control group; 6) beginning 3 days prior to induction of laminitis. All horses were given 3 oligofructose loading doses (1 g/kg each) at 24-hour intervals and a laminitis induction dose (10 g of oligofructose/kg) 24 hours following the final loading dose (designated as 0 hours) via nasogastric tube. Serum glucose and insulin concentrations were measured before administration of the first loading dose (baseline) and at 0 and 24 hours; urine protein-to-creatinine (UP:C) ratio was determined at 0 hours and every 4 hours thereafter. Lameness was evaluated every 6 hours, and horses were euthanized when Obel grade 2 lameness was observed. RESULTS: Mean±SD time until euthanasia did not differ significantly between the heparin-treated (28.9±6.5 hours) and control (29.0±6.9 hours) horses. The UP:C ratio was significantly increased from baseline at 20 to 28 hours after induction of laminitis (ie, 4±4 hours before lameness was evident) in control horses but did not change significantly from baseline in heparin-treated horses. Serum glucose or insulin concentration did not change significantly from baseline in either group. CONCLUSIONS AND CLINICAL RELEVANCE: Urine protein excretion increased during the developmental stages of carbohydrate-induced laminitis in horses; administration of heparin prevented that increase, but did not delay onset or decrease severity of lameness." See "Foundered Horses: Support, Stimulation and Pain Relief" towards the end of the article. Horses sometimes come to TLS for help that are suspected of having laminitis, but they turn out to have a broken back or forward hoof pastern axis, and/or navicular syndrome, which is responsible for their lameness. Is hoof wall surface temperature (HWST) a useful indication of laminitis? Increased hoof wall surface temperature is often seen in acute (and flared up chronic) laminitis cases. However, horses without laminitis can have fluctuations in HWST throughout the day, with differences being measured between feet. The measurement of HWST has been validated as a non-invasive index of blood flow in the foot by researchers, but under ambient temperature-controlled conditions. 4,320 coronary band temperatures (CBT) were obtained from 6 horses fed different diets. The CBT ranged from 9.6° to 35.5°C. Coronary band temperature followed a diurnal pattern and was positively associated with ambient temperature but was not associated with diet. CBT of healthy horses varied significantly during the day and among limbs." Hoof wall surface temperature was monitored in (insulin-sensitive) horses with hyperinsulinaemia-induced laminitis (insulin > 700 µIU/ml) - the ambient temperature was kept constant at all times (15.9 +/- 0.4'C). The HWST varied from around 26'C to 17'C over 48 hours in the control horses, with a gradual decrease in temperature. The HWST in the hyperinsulinaemic horses increased over the first 12 hours from around 22'C to around 27'C then remained elevated (see p13). The elevated HWST results indicate that there is a vascular component to the development of insulin-induced laminitis. Am J Vet Res. 2005 Apr;66(4):630-6. Digital blood flow and plasma endothelin concentration in clinically endotoxemic horses. Menzies-Gow NJ, Bailey SR, Stevens K, Katz L, Elliott J, Marr CM. "Significant associations were found between an increase in digital pulses, hoof wall temperatures, or both and increased digital blood flow (0.14 vs 0.04 mL/min) on day 2 and increased digital arterial diameter (0.32 vs 0.23 cm) on day 5." Equine Vet J. 2004 Apr;36(3):267-72. Bailey SR, Menzies-Gow NJ, Marr CM, Elliott J. "Tryptamine and phenylethylamine infusions had no effect on systemic arterial blood pressure or heart rate, but caused significant decreases in digital arterial blood flow (mean +/- s.e. 29.2 +/- 8.5 and 18.4 +/- 6.8%, respectively). Both amines also caused decreases in dorsal hoof wall temperature (0.6 +/- 0.1 and 0.5 +/- 0.1 degrees C for tryptamine and phenylethylamine, respectively) and concomitant increases in plasma 5-HT concentration." Am J Vet Res. 2001 Jul;62(7):1167-72. Evaluation of hoof wall surface temperature as an index of digital vascular perfusion during the prodromal and acute phases of carbohydrate-induced laminitis in horses. Hood DM, Wagner IP, Brumbaugh GW. "Determination of HWST is a valid technique to evaluate digital perfusion under appropriate controlled conditions in horses. Digital hypothermia detected during the prodromal phase of laminitis is consistent with decreased digital vascular perfusion or metabolic activity." Laminitis was induced by starch overload (sepsis-related laminitis) and hoof temperature measured in horses kept in an environmental chamber at 10'C, and compared to controls. "Recording hoof temperature was a successful, noninvasive, method to measure indirectly, shifts in digital blood flow against a background of cold induced, physiological, vasoconstriction. High hoof temperatures were assumed to indicate digital vasodilation and low hoof temperatures digital vasoconstriction....Analysis of mean hoof temperature graphs showed that horses judged laminitis positive (from histological evidence) had experienced a period of prolonged digital vasodilation 16-40 h after carbohydrate overload. Laminitis negative horses experienced no such period of vasodilation and never had hoof temperatures significantly (except once, at 28 h) above that of controls. The only parameter which significantly differentiated the laminitis positive from laminitis negative horses, between 12 and 32 h after carbohydrate overload, was foot temperature, which was significantly higher in laminitis positive horses (P < 0.05). Therefore, a period of sublamellar vasodilation, 12 to 40 h after alimentary carbohydrate overload precedes the onset of laminitis." Equine Vet J. 1992 Mar;24(2):134-9. Hoof and distal limb surface temperature in the normal pony under constant and changing ambient temperatures. "It was concluded that clinical interpretation of limb surface temperatures in ponies required an awareness of ambient temperature conditions." Hyperhidrosis (excessive sweating) is seen in some horses with PPID. According to Harold Schott (Pathogenesis and diagnosis of equine Cushing's disease (Proceedings) Apr 1, 2010) this is commonly seen over the neck and shoulder areas. Anecdotally, the sweating is often patchy, often on just one side of the horse, and is often reported on the belly as well as the neck and shoulders. For less sweating than normal see Anhidrosis. Ponies, miniatures and donkeys are particularly prone to hyperlipaemia if they stop eating. Hirsutism (hypertrichosis) - an abnormally long, thick, often curly coat that fails to shed - is considered the most unique and specific clinical sign of PPID, and therefore diagnostic of the illness, but is now considered an advanced sign of PPID and may be one of the last signs to be seen. hanging on to the winter coat for longer than other horses (delayed shedding) (and developing a winter coat before other horses?). A lightening in coat colour may be seen in horses with darker coats. increased production of androgens by the adrenal glands (Lloyd Inc 2008). In humans, hirsutism is linked to PCOS, excessive androgens, severe insulin resistance, excess ACTH, Cushing's syndrome, hyperprolactinemia, use of corticosteroids, ovarian and adrenal tumours. A horse with advanced PPID clipped for comfort, but note the long curly hairs on his legs. Hypertrichosis in a horse with alimentary T-cell lymphoma and pituitary involvement. Mitsui I, Jackson LP, Couëtil LL, Lin TL, Ramos-Vara JA. "At necropsy, the mare had hypertrichosis and the pituitary gland was diffusely enlarged. Histologically, neoplastic lymphocytes infiltrated the gastrointestinal mucosa, mesenteric lymph nodes, and the pituitary gland. In addition, there was hyperplasia of the pituitary gland pars intermedia. Pituitary adenoma was not present. Hypertrichosis in this case could have been triggered by a combination of adenomatous hyperplasia of pars intermedia and lymphoma resulting in disruption of the hypothalamic dopaminergic tone or disruption of the hypothalamic thermoregulatory center." NB PPID does not usually involve lymphoma - this is thought to be the first report of lymphoma affecting the pituitary gland of a horse. Is an abnormal haircoat always diagnostic of PPID? No - according to Dianne McFarlane a long haircoat is not an absolute diagnosis of PPID - it is highly suggestive in an old horse but other things can cause the haircoat to not shed appropriately. She has found that horses that are very debilitated/malnourished may test positive for PPID and show clinical signs of PPID including not shedding normally, but once they are back to a good weight and more healthy they no longer test positive for PPID, shed their coat normally, and when their pituitary glands have been examined at post mortem they have been normal. She suggests that the stress of being debilitated may affect their endocrine axis and affect their haircoat. See Is it PPID or is it EMS?